Volkswagen car sales are plunging fast as customers in its key markets turn away from the battered car maker. VW brand sales in the U.K. plunged 20% in November, following a nearly 10% drop in October, the Society of Motor Manufacturers and Traders said on Friday. Britain is the car maker's fourth biggest market: 12,958 new VW cars were registered in the U.K. last month, down from 16,196 in November last year. The latest British data follows even more disappointing news from the U.S., where VW sales declined 25% in November. Volkswagen is in crisis over rigged engine emissions tests. The company admitted that as many as 11 million of its diesel vehicles worldwide had software that could cheat nitrogen oxide emissions tests. It will need to recall nearly 500,000 cars in the U.S., and about 8.5 million in Europe. The scandal also affected other Volkswagen Group brands, such as Audi and Skoda, but the drop in sales of the VW-branded cars is the most dramatic. Volkswagen's sales are suffering across the world, even in Germany, Volkswagen's home market. Sales there declined 2% in November, even though the overall auto market grew 8.9% in the same period. "I suspect there's an element of patriotism," Neil King, the head of automotive research at Euromonitor, said. "Consumers don't blame the whole company and certainly don't want to see it suffer to breaking point, especially given the sheer number of jobs that are at stake, both directly and indirectly," he said. In France, Volkswagen Group's fifth biggest market, November sales rose 4.4%, lagging behind the overall market's growth of 11%. "It's growth, but they are losing market share, that's the important part here," King said. The smaller drop in European sales could be due to the fact that cars there are ordered ahead of time and delivery can take months. So cars registered in November were actually ordered well before the scandal broke. 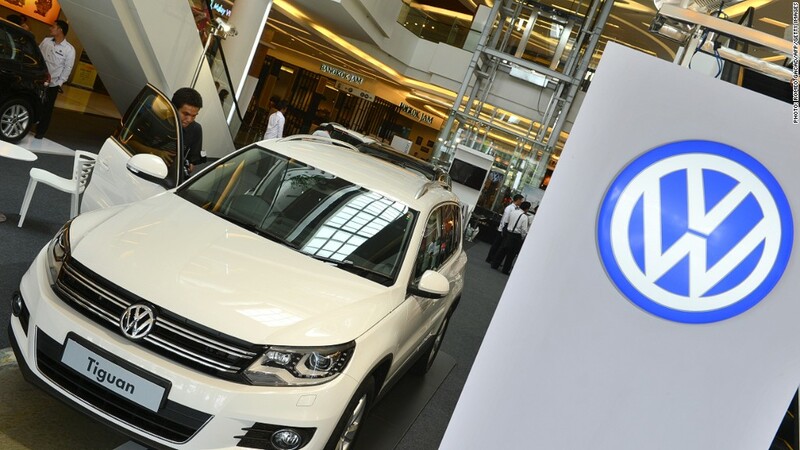 Sales in China, Volkswagen's biggest markets, grew 1.8% in October. That's a disappointing number compared to the overall market's 11.8% growth. Volkswagen might recover from the slump. Sales of Toyota (TM), which declined after a faulty brake pedal issue, bounced back after some time, as did GM (GM) sales following the ignition switch scandal. But analysts expect Volkswagen (VLKAY) will be suffering for longer due to the nature of the scandal. "The fact that this was a deliberate deception as opposed to a technical error means it will undoubtedly be more severe and prolonged," King said.